Catheter Syringe Adapter is a disposable connector for attaching syringes to Medical Tubing. 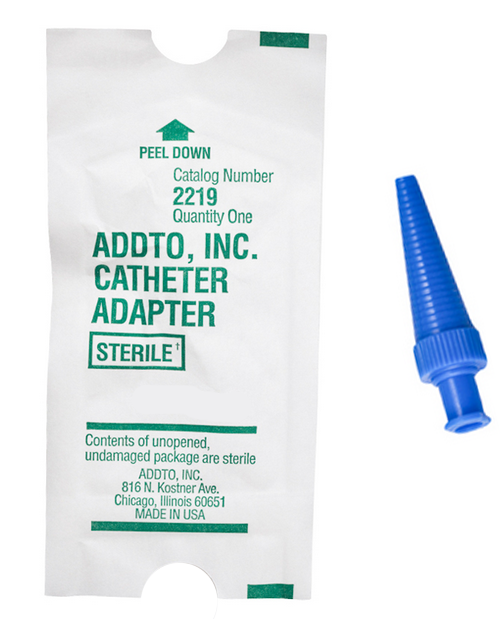 Manufactured by Addto, the Catheter Adapter is used for general catheterization, irrigation, aspiration, drug injections, anesthetics, contrast media, surgery procedures, X-Ray procedures and any other medical procedure where the attachment of syringe is desired. The Syringe Adapter locks on to syringes with Luer Lok fittings on one end and to flexible medical tubing with diameters ranging from 1/8 Inch to 5/16 Inch. Packaged in individual wraps, these Catheter Syringe Adapters are sterile. Adaptive to many sizes of flexible medical tubing. Fit all flexible tubing with lumina 3 mm through 8 mm. Catheter Syringe Adapter Product Number: 2219. Width: Tapered Outside Diameter ranges between 3 mm to 9.5 mm (1/8 Inch) to (3/8 Inch). 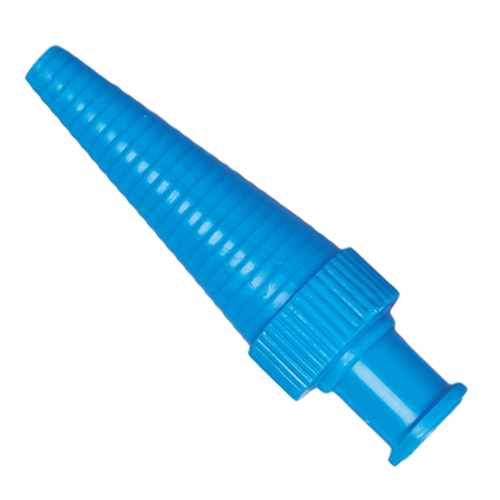 Tapered Inside Diameter for standard metal, glass tip, and disposable syringes. Positive gripping ridges with Lumen 2.35 mm (3/32 Inch) minimum. Class 1 Sterilization using Ethylene Oxide. Item # 2219 can this be used as a CSTD for a Catheter Tip? Would like a sample if possible. Hello Mrs. Yeager-Drake: Unfortunately we can't answer whether this item can be used as a CTSD; we don't employ any medical professionals here. We also do not offer samples to customers, because we are not the manufacturer. it's best to contact the manufacturer directly for sample requests. I was very excited when I found these here after first encountering them in the hospital! It was so convenient to be able to access both the feeding and med ports on my G and J-tubes with the same syringe! Unfortunately, even with only just minor to moderate pressure, these adapters cracked at the neck within the first 2-3 days. Until they make these in a more durable material, I suggest purchasing 3 times the amount you originally anticipated! I have a feeding tube. When it is time to 'inject' some meds they have to be exactly 30 Ml for one and 5 Ml for the other I used to have to take that size syringe, fill it, then expel it in the standard 60Ml catheter tipped syringes. NOW with this fantastic item, I have attached them to the smaller syringes and I can inject right into my feeding tube ... I will NEVER be without them again !!!!! My surgeon gave this to me to adapt my feeding tube adapter. I don't take it on and off, it stays screwed into my adapter. It works fantastic for me for that purpose. Great product, but don't put undue pressure on it, or over time it will crack! Excellent product. The adapter makes using the same irrigation syringe for different size catheters so easy. If you put too much pressure on it repeatedly it will crack at the neck, so push steadily with medium controlled pressure when using. Very quick delivery. catheter splits apart at the seam during use. Poorly made.